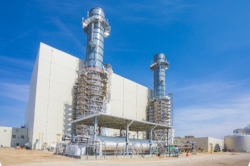 MARSHALLTOWN, IOWA – Iowa’s first Envision Platinum-verified energy project and first-of-its-kind nature path and prairie restoration are just parts of the state’s newest combined cycle natural gas power plant. With more than 63 acres of restored natural prairie, a 7-acre nature path and 1/3rd-mile trail, the Marshalltown Generating Station is a beacon of forward thinking and environmental stewardship. As one of the most efficient natural gas plants in the country, the new plant can power more than half a million homes by mixing cutting-edge and field-proven technology. At $645 million – nearly half the cost of a comparable coal-fired plant – the new plant is the most sustainable and affordable plant that Iowa has ever had. The plant will replace 14 less efficient, smaller and older generating units, while emitting less than half the carbon dioxide, two-thirds less nitrogen oxides and roughly 99 percent less sufur dioxide and mercury than traditional coal-fired plants. Marshalltown Generating Station is also a model for future energy plant development. With the ability to quickly respond to regional wind resources – including wind and solar energy – the importance of which will only continue to grow as the makeup of the nation’s energy supplies shift. By working as a true community partner, the team was able to integrate upgrades to the city’s natural gas feed and provide justification to the water utility to complete necessary upgrades to the water supply. Alongside these upgrades, the new plant will be more efficient – utilizing a 1.3 million-gallon on-site storage reservoir to save resources and draw water during low demand periods. Constructing the plant also created more than $50 million in economic benefit to the community and provided more than 600 jobs to complete. To contain noise within the plant and be a good community member, the team sought additional noise-dampening elements such as enclosing the facility, putting silencers on large steam vents and using low noise cooling tower fans – even though there were no noise ordinances. By repairing the environment after construction, building a public park trail and providing a sustainable, efficient form of energy, the project teaches community and industry members to be sustainable by example. The project serves as an example on how to expand energy needs while collaborating with the community and integrating environmental concerns throughout plant design and operation.